The Dakota Access oil pipeline will not be rerouted, despite mass protests, its developer has said. The Dallas-based company is ready to negotiate with tribal activists, who say that talks won’t make a difference. "There's not another way. We're building at that location," Kelcy Warren, the CEO Energy Transfer Partners, told the Associated Press, despite President Barack Obama’s recent indication that the government was looking into alternatives. Warren told the new agency that he was ready to sit down with Dave Archambault, the chairman of the Standing Rock Sioux tribe, to talk about the $3.8 billion pipeline and ease their concerns. "We already know what he's going to say — that this is the cleanest, safest pipeline ever," Archambault told AP. "What he doesn't know is that this is still an issue for Standing Rock and all indigenous people." The 1,200-mile-long pipeline would carry 500,000 gallons of crude oil every day from North Dakota through South Dakota and Iowa to a shipping point in Illinois. Sioux tribe members and environmental activists are concerned that it could pollute nearby water sources and destroy tribal sacred sites. Hundreds of people have been occupying federally owned land, through which the four-state pipeline would run under a Missouri River reservoir. "We're going to cross the river at that location," Warren told AP, saying that it would be the "least impactful" site. About 85 percent complete, the pipeline construction has been halted since September due to protests. Arguing that the delay “has no purpose whatsoever,” Dalrymple has called on the US Army Corps of Engineers to speed up its review of the issue of allowing pipeline opponents to camp without a permit on its property. 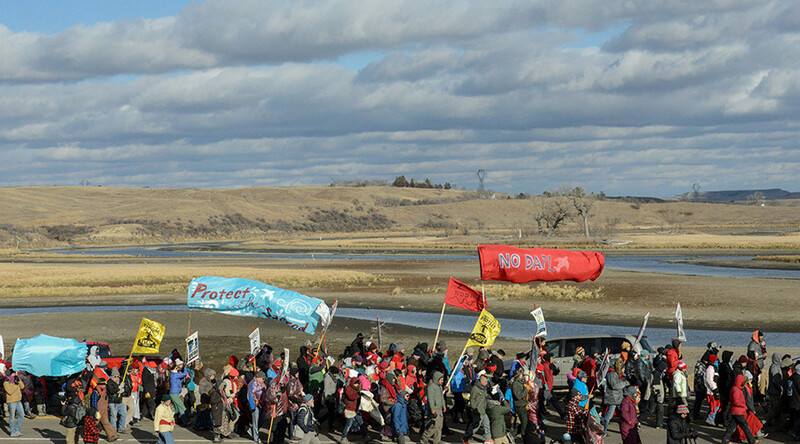 On Tuesday, the Army Corps of Engineers informed the Standing Rock Tribe and the corporations behind the pipeline that “additional discussion and analysis are warranted” about the government granting an easement for construction on federal land. “While these discussions are ongoing, construction on or under Corps land bordering Lake Oahe cannot occur because the Army has not made a final decision on whether to grant an easement,” the Interior Department said in a statement. In July, the Army Corps of Engineers granted the developer the permits needed for construction, but then said it needed more analysis given the tribe’s concerns.